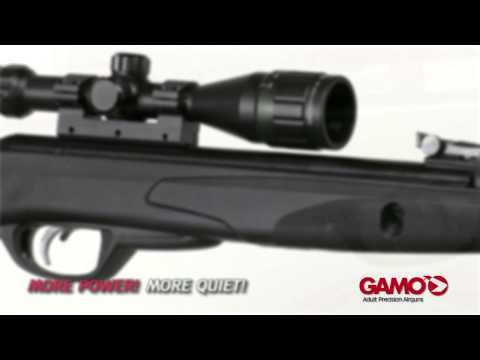 With their Silent Cat and Whisper rifles, Gamo have tried to make a name for themselves as a producer of quiet rifles that will not scare away vermin or pests with the first shot enabling a capable hunter to hopefully eliminate multiple pests without the rest scattering, or take a second shot if the first misses. The Whisper Fusion Pro, chambered for .177 or .22, is one of the quietest air rifles ever produced and it really lives up to its name. Along with its near silent firing, the Gamo Whisper Fusion Pro boasts very respectable accuracy, with very nice power and all with minimal recoil thanks to its shockwave absorbing stock, specially engineered for maximum ergonomic comfort and minimal kickback. The silent firing aspect of this air rifle is all thanks to its “polymer jacketed steel barrel and double integrated noise dampening technology”. To put it simply; the gun comes with an extra layer of thick material around the barrel, in addition to a suppressor at the end of the barrel, each of which work to keep the gun quiet during firing. It works, and actually reduces the noise of a shot by up to 80%, which is no small task. Along with near silent firing, the Whisper Fusion Pro offers great velocity at up to 1400 fps, depending obviously on the type of pellet used, as the .22 is somewhat slower, usually around 1000-1100. On top of the power and silence, the makers of this rifle have argued that even out to 40 yards, it can still hit targets and make tight groupings, but again, that is only achievable using quality ammunition. This air gun has plenty of fans and for good reason. It is fairly expensive, at between $320-$350, depending on the retailer, but most users will argue that given the numerous great things that this rifle offers to its shooter, it is worth every cent. It boasts very respectable accuracy and power, in addition to near silence and a very shooter-friendly shape and weight. It is on the heavy side for an air rifle, but it has a great balance between weight and length. Finally, Gamo put a lot of work into designing the stock for their Whisper line of rifles, and as such, the stock reduces a ton of recoil, in addition to feeling great in the user’s hand. Accuracy is one of the Gamo Whisper Fusion Pro’s major perks. It is not the most accurate rifle out there at .177 or .22, but it can achieve sub-inch groupings at 25 yards, which is a great stat for any gun costing just a bit over $300. It doesn’t matter what size of pellet you fire, as long as they are of good quality, they will reach their target. It gets a bit shaky beyond 25 yards, but the .22 still packs plenty of power at that point and can hit pop cans with decent velocity even out to close to 50 yards, but at that point, groupings become a bit unreliable. Both the .177 and .22 pack decent power and can be used for both targets shooting and hunting. The .177, gets shot at between 1200 and 1400 fps and is deadly accurate out to around 25 yards and can take down most pests such as rats, while the .22, which flies at around 1000 to 1100 fps has significantly more range and killing power and can easily make quick work of rabbit sized critters along with even some bigger animals with the right accuracy. As .177 and .22 air rifles go, this is one of the most powerful that are available for this type of price. It’s not cheap but it is still affordable and the power is there for sure. The stock does however, do a great job of minimizing recoil and the power is rarely felt in a negative way by the shooter. Sound is where this air rifle really earns its stripes. While it is impossible to silence a pellet flying through the air at supersonic speeds, the Whisper does a very nice job of minimizing the sounds of actually firing the round. Is it silent, as the company sometimes likes to boast? Absolutely not, even military grade suppressors don’t completely silence a gun, but for a pellet gun that comes with a built in suppressor, for just over $300 USD, this is a nice system that most air gun shooters will enjoy firing. For the most part, this is a sturdy and well-built air rifle, but misfires and simply not firing at all have been known to happen. Other than that, it has no reliability issues and can be counted on to fire time and time again. It is not particularly durable however, and parts have been known to break. It is tough to rate the value of this air rifle because it is good all-around in terms of noise, accuracy and power, but it simply does not outperform some other rifles that actually cost less enough to justify its sale price. With that said, it does outperform some other rifles that actually cost more. But value can vary from person to person depending on what each person is looking for. In this case, if you are looking for an accurate and fairly powerful air rifle that can kill small game and vermin from around 25 yards that is also pretty darn quiet, this is the right choice and value is through the roof. Unfortunately, the system is not perfect and the people at Gamo have over-bragged the sound dampening system. At the end of the day, the Gamo Whisper Fusion Pro is a great air rifle that has both target practice and hunting practicality. It has its quality control demons, but with proper treatment and maintenance, you shouldn’t have any problems. The quiet shooting is a nice addition. Gamo have done great work on this one.